The phablet wars are heating up. We got our first look at Sony's massive Xperia Z Ultra last month, and Samsung is due to unveil the successor to the Galaxy Note II in September, but it seems HTC refuses to be left out of this race. “Leaked” information from several tech websites gives us a fairly comprehensive idea of what to expect from the upcoming HTC One Max. The oversized smartphone will feature a 5.9-inch full HD display, a 2.3 GHz Qualcomm Snapdragon 800 quad-core MSM8974 processor, 2 GB RAM, 16 GB internal memory, a microSD slot, BoomSound, a 2.1 MP wide angle front-facing camera, an Ultrapixel back-facing camera, a 3300 mAh battery, and an unspecified form of stylus support. All in all these are very similar specs to what we've already seen in the Z Ultra with a couple proprietary tweaks. But the Taiwanese company has built in a few extra features to try and attract a little more attention – the Max will have an integrated fingerprint scanner on the back face as well as an optional protective case with a built-in secondary battery (1250 mAh). 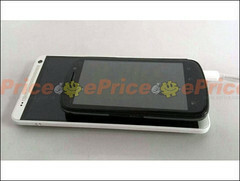 The device is also listed as running Android Key Lime Pie, an as yet unannounced update to Google's mobile OS. If these rumors turn out to be true, HTC may have a very interesting product on their hands. Though we'll have to wait and see what Samsung has in store for us with the Galaxy Note III to see how the One Max stacks up against the competition.